The October 2018 edition of Marine Technology Reporter is now available in print and online. 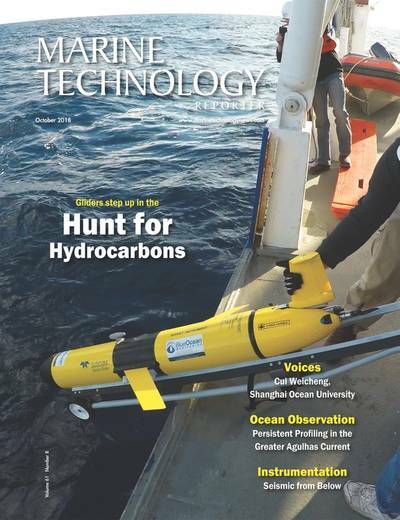 The hunt for hydrocarbons: Subsea gliders are taking to the oceans to hunt for an ever wider array of anthropomorphic and chemical signatures to an ever greater accuracy. A “National Hero”: Shanghai Ocean University’s Professor Cui Weicheng is breaking new ground in the subsea sector, both in science and business. Ocean Observation: Two decades of moored ADCPs off southern Africa, as the Greater Agulhas Current is suspected to influence the global climate system. Instrumentation: The acquisition of seismic data using nodes placed on the sea floor, Ocean Bottom Seismic (OBS) and its use in deep water with Ocean Bottom Nodes (OBN) have been growing rapidly. SeaExplorer Underwater Glider: A new tool to measure water velocity; glider-based ADCPs yielding promising results for measuring depth-resolved currents profiles in open-waters.